If you need to re-load a large number of families, right clicking the family name in the project browser, and hitting "Reload" may become a long and tedious process. Instead, you can select all families files, in Windows Explorer, and Drag&Drop them into a Revit window. Revit (I tried with 2009) will ask you if you want to load the families, or open the files in separate windows. Chose Load, and Revit will reload every file you dragged&dropped, also asking, time by time, if you want to make the family editable, and if you want to override the parameters value. I believe most Revit users must know that by clicking inside a schedule's cell, then "touching" another view, will basically select that scheduled element, in the model. 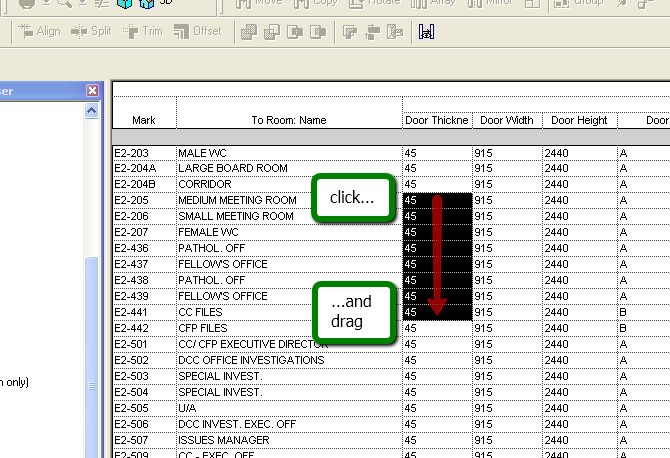 For example, you click inside a door width field, in a door schedule, and that door will be selected in the model. You can also click on "Show", in the schedule's option bar. However, what if you would like to select several elements, that is, several rows in the schedule? The SHIFT or CTRL clicking does not work, like it would in Explorer, for example. Scheduling curtain panel doors, by level. 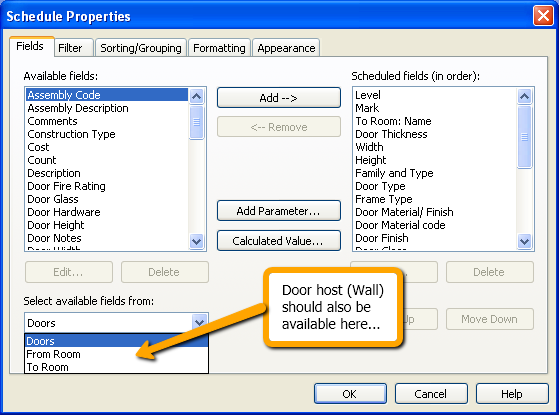 If you make your door schedule to sort / filter doors by level, you may, sooner or later, fall in one of Revit many little road blocks: curtain panels assume their level from the level of the curtain wall they belong to, including door curtain panels. Did you gasp yet? Yes, this means that if you have doors placed on different levels but belonging to the same curtain wall, they will all have the same level, which is the base level of the curtain wall itself. I think Revit should provide a "Level" field in the curtain panel elements, which the user can adjust, selecting the appropriate level. 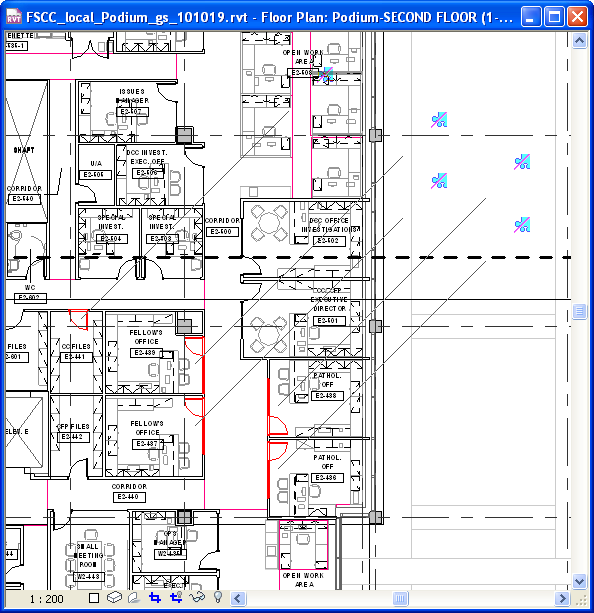 Better yet, Revit should simply assign the closest level to the curtain panel elements. End of it. Shared Parameters, "Type" versus "Instance". 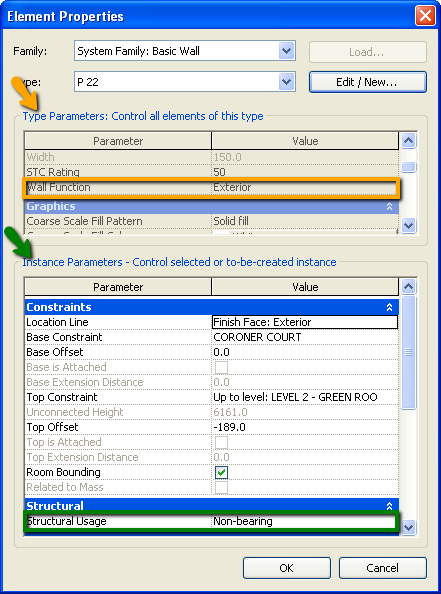 Here is a lot of great information on shared parameters, from Steve Stafford's blog. Make sure to check his other posts on the subject, linked at the end of the post. The one thing Steve does not seem to talk about is how do you change a shared parameter from "type" to "instance". One of our Revit model manager just told me she was editing door families and changing the "Frame Detail" parameter from Type to Instance. It just hit me: if a shared parameter comes from a family, you can edit it in the families of the elements it is assigned to; for examples, doors. I need to further investigate this, but it appears a great feature to me, whom I have been always very confused about how rigid shared parameters seem to be. Scheduling elements in linked files, and the Filter by Level issue. We are using a door schedule which filters doors by Level. We have several linked files, which have some doors as well. Once you click in the "Include elements in linked files", in the Fields Tab of the Schedule Properties, the Level parameter disappears from the list of available parameters in the Filter Tab.... This means that you cannot filter by Level if you are trying to schedule elements in linked files. Most likely, there is a way to use some other parameter by which you can filter your doors, but this introduces a new item in the list of human-driven errors that your project will have. The reason why Revit behaves in this way (at least in Revit 2009), quite obviously, is that Levels in linked models may not match Levels in the host model, even if they are called in the same way. In other words, two models with the same identical set of levels, may still be nested in a way that make the levels not match. Still, one would have hoped that Revit would allow you to "calibrate", or "register", the levels of nested models, so that scheduling elements by Level would be possible. In a similar way in which you can map phases, actually. Have you ever demolished a door? I bet you did. What Revit does, is to automatically create an infill which replaces the opening in the wall. This is great, also considering that the infill will properly show as "New" and the rest of the wall "Existing", and setting up construction plans is a breeze. Now, if you have more than two phases, and you are trying to show those infills as new, in a phase in the future of when you demo'd the element, then Revit will "see" both the (E) wall and the automatic infill as "Existing". Then, no matter what phase filter you apply, there will be no way to show the infill different from the wall. In other words, they will blend together. The only work around I found is the old trick of the overlapping plan views. You need to create another plan view, where everything is off except your in-fills. Then set the phase filter to display them black, and overlap this plan on your new floor plan view. At least, after the initial setup, everything will be fully BIM intelligent.